Learn how to configure the default Mobile coupon bar and success bar! 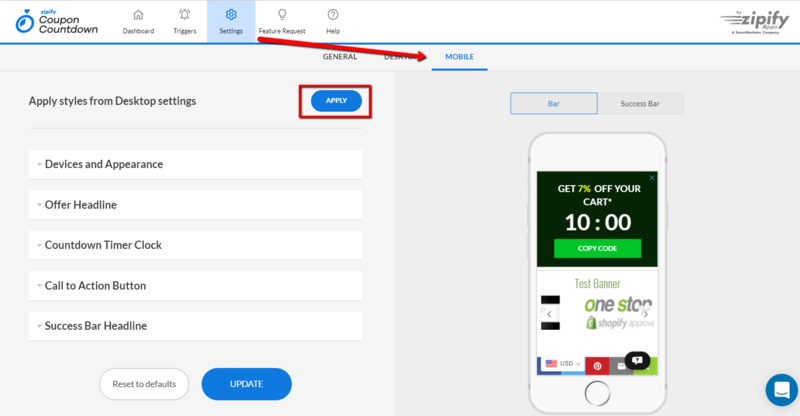 When one of your Trigger's conditions is reached on a mobile device, Coupon Countdown will generate a bar offering a unique one-time-use coupon code along with a discount lifetime timer. When a visitor clicks the button on the bar to claim the coupon, a success bar will then appear at the right-hand-side of the screen. The default appearance and functionality for the mobile bar and success bar can be configured at Settings > Mobile. Note: You will have the option of using a "Custom" bar and success bar for each Trigger that you setup as well. If you want your Mobile version of the bar and success bar to use the styles you've already setup for the Desktop version, just click the "Apply" button for the "Apply styles from Desktop settings" option. This will save you time and ensure that the styles on Desktop and Mobile match. Popup position - Choose either the "Default" or "Sticky" option. The "Default" option will have the coupon bar appear at the top of the page on mobile devices. Note: This is true even if the customer has scrolled down the page. I.e. they won't see the coupon bar until they scroll back to the top of the page. 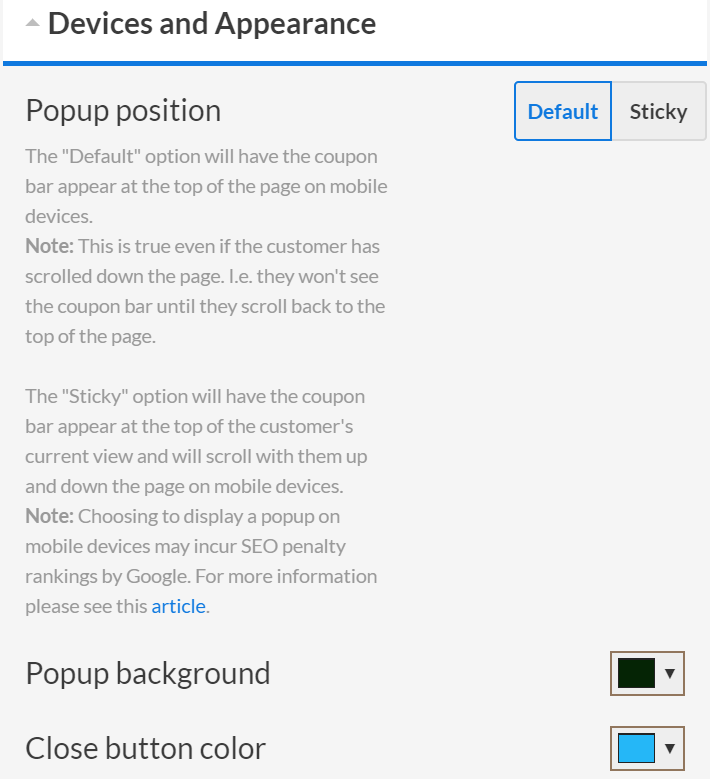 The "Sticky" option will have the coupon bar appear at the top of the customer's current view and will scroll with them up and down the page on mobile devices. Note: Choosing to display a popup on mobile devices may incur SEO penalty rankings by Google. For more information please see this article. Popup background - Choose a popup background color. Note: There is no option to set a background image for the popup on mobile as you can with the popup on desktop. Close Button Color - Select a color for the close button (X in the top-right corner). To save your changes click the "Update" button at the bottom of the screen. In this block you can configure the timer’s appearance by choosing a font style, a font size, a font family and a color. Configure an appearance of the button on the bar by specifying its color, sizes, border corners and a button text format. Edit the discount confirmation text that appears in the success bar, after a user clicks the Call to Action Button. Discount Value - substitutes a specified trigger's settings discount value. For instance 10%, 100% or Free shipping. Discount Code - substitutes a generated discount code. Discount Lifetime - provides information about the discount's lifetime. Condition for Discount - provides information about conditions of discount usage. Discount Additional Condition - contains information about additional parameters/terms of discount usage. Discount Minimum Purchase - contains information about a minimal purchase value specified in a trigger’s settings for the discount to work properly. Customer Country - contains information about a visitor’s country. Customer Region -contains information about a visitor’s region. Customer City - contains information about a visitor’s city. These variables are substituted in text as @discount_value in the WYSIWYG editors. It is important to substitute and delete variables in the specified format. To Save all of your edits and changes, click the "Update" button. Click the "Reset to defaults" button to revert changes and apply the default settings used when the app was first installed.